I think that one of the most important things we all can do right now, in these challenging times​, is to come back to our hearts. Come back to our peace. Come back to our breath. Over and over, day by day, hour by hour. 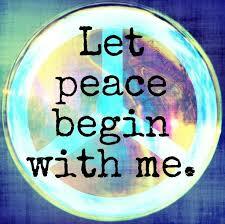 Peace always begins within. And within the heart. And then it ripples out into the world from there. Put your hands on your heart and say: May there be peace. May there be peace in my heart, and peace in my body. May there be peace in my home, and peace in my community. May there be peace in my life, peace in my country, peace on the planet. And then, with your hands still on your heart, just breathe in peace, and breathe out chaos, distrust, fear, sorrow, anger, whatever it is that’s causing you to lose your balance. Breathe in peace, and then, from your heart, breathe peace out into the world, and let it ripple out into the ethers, and into the web of the all. Remember that the energetic heart is much bigger and stronger that you may believe! Don’t be afraid to use your heart to settle and rebalance yourself when things are challenging. And then exhale, and let go, sending waves of peace rippling out into the world, for us all. Do it again tomorrow, too.